At their Nairobi headquarters today, Kenya communications company, Safaricom announced another record year with the release of the Safaricom 2017 results, which CEO Bob Collymore credited to a focus on customers, innovative products and improving operations. The company reported revenue of Kshs 204 billion (~$2 billion), an increase of 15% from the year before, and an astounding EBITDA of Kshs 103 billion ($1 billion), up from 83 billion in 2016. M-Pesa growth was 33% to Kshs 55 billion as the number of active M-Pesa customers increased to 19 million – who do an average of 10 transactions a month. The number of customers also went up 12% to 28.1 million. Later, their CFO said the results came even as customers enjoyed lower costs of voice calls, SMS and money payments. Under “M-Pesa” Kadogo, the company waived M-Pesa tariffs for payments below Kshs 100 ($1) in a push to drive financial inclusion and this led to an 88% growth in transactions in that band. Chairman Nicholas Nganga said that “Sustaining this growth is key to the Board” as he announced that the contract of Bob Collymore had been extended for an additional two years. 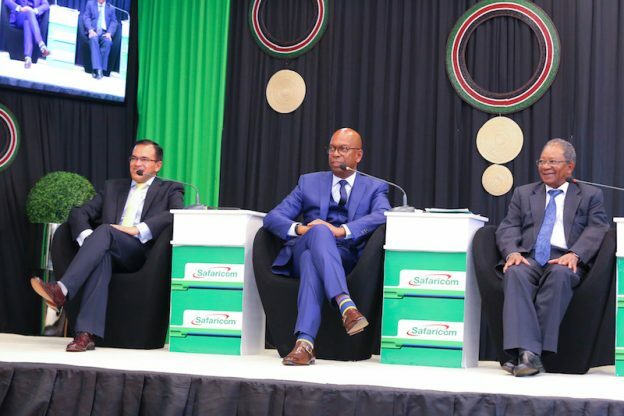 Collymore, in turn, said that at a time when several Kenyan companies were announcing job losses, Safaricom had added 500 new jobs during the year and would be adding another 270 mainly in customer care. Going forward, Safaricom will be changing their earning outlook from projecting EBITDA to projecting EBIT (earnings before interest & taxes) – and for 2018 they project EBIT to be between Kshs 71 to 75 billion after capital expenditure of between Kshs 35 and 38 billion that will be spent in 2017/18. Following the release of the Safaricom 2017 results, their shareholders will get a dividend of Kshs 0.97 per share, equal to 80% of the profit, is an increase of 27% from 2016 – excluding the one-time bonus dividend paid out last year. The payment will total Kshs 38.8 billion, and 35% of that goes to the Kenya government as the second largest shareholder after Vodafone. This entry was posted in M-Pesa, NSE investor awareness, Safaricom, Safaricom IPO, Safaricom profit, vodafone on May 10, 2017 by bankelele.